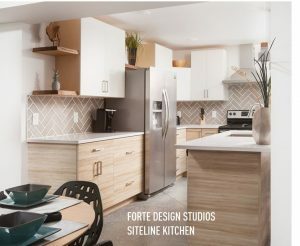 Megan Tennant of Forte Design Studios in Fort Collins, Colorado, has been working with the Siteline cabinet brand for about a year. 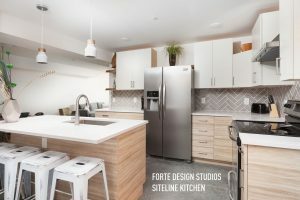 Recently, she used Siteline cabinets in a rather unique kitchen project. Megan says, “The home is a stunning contemporary design that is located in “Old Town” Fort Collins. Old Town is designated both a national and local-historic district with 28 historical buildings, including the Armstrong Hotel, a Fort Collins landmark. Originally built for a long term rental use, this home transitioned into an Airbnb property, and has made quite a design impact in the area. Airbnb is an online marketplace and hospitality service, enabling people to lease or rent short-term lodging. The lower level kitchen space presented Megan with a few design challenges, not the least of which was the ceiling height – which is low. The client wanted the unit’s overall height to “feel” higher. Megan’s solution was to incorporate alternating heights of the wall cabinets as it not only gives the wall cabinets’ dimension, but opens up the space. 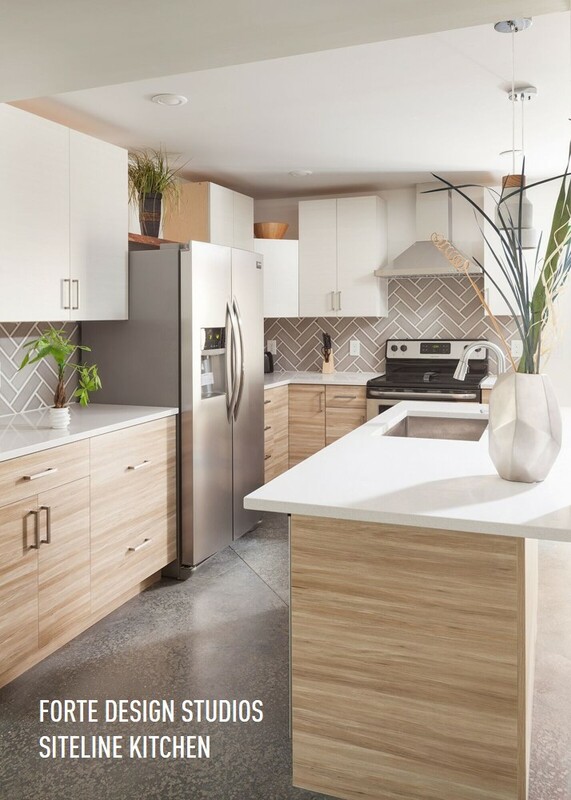 For this two-toned kitchen, Megan used the Siteline “Harington” door style in the soft white “Antler” pattern for all upper cabinets, and the same Harington door style, but in the “Pacaya” pattern for all lower cabinets. She then blended this inviting space with warm radiant heat concrete floors, bright clean quartz countertops and bold herringbone subway tile backsplash.